Today begins a new series of pictures combining sport and the iconic numbers associated with some of its greatest practitioners. I'll be trying to add a new one every Friday morning, but you know what I'm like. Flaky. Keen-eyed viewers will also notice that I am not doing them in any kind of order, least of all numerical order. This is a deliberate strategem on my part to make the project seem like more fun and less like a self-imposed prison. Where, of course, the gaoler is me and the terms are fairly lenient. Flaky, you see. Anyway, the first entrant is probably best known to British people as the co-pilot in the 1980 disaster comedy film Airplane! 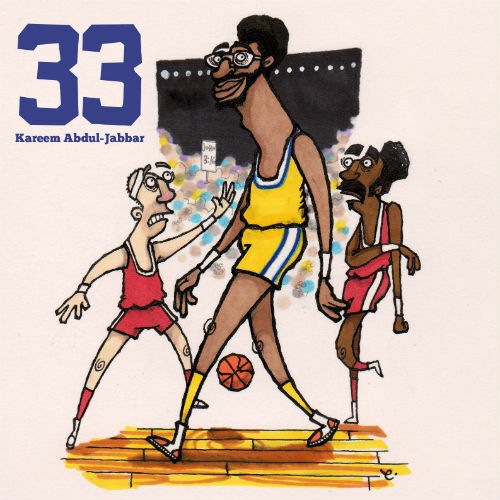 but the majority of Americans recognise him instead as perhaps the greatest basketball player of all time, Kareem Abdul-Jabbar. Virtually every other rival he has for that title is also on my list awaiting being drawn by the way, so don't panic too much. He is also an excellent reminder that US sporting greats can appear in motion pictures and not subsequently murder their wife.